Gatehouse Design can support CTO companies with all stages of the product design, configuration and automation. New product development, developing strong well-structured standards. Incremental product development, improving the efficiency of a product or manufacturing process. Improvement of existing product definitions which can help secure new customers or manufacturing processes. Design automation can be used to drive downstream processes such as 3D CAD, resource planning systems (ERP) or other processes. 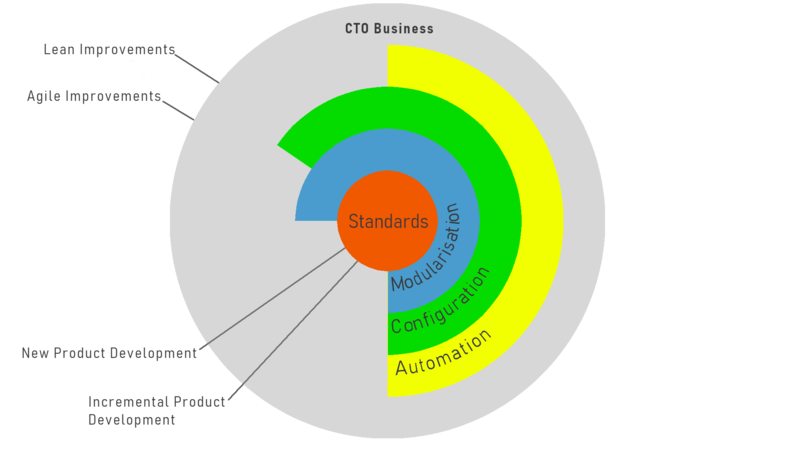 CTO is a variant of make-to-order production approach in which configuration starts only after a customer’s order is received. Product standards will be pre-defined. We can help companies develop new products or modify existing products to suit new markets. Our engineers can help you at every phase of new product development from concept, evaluation, detailing, production and securing new intellectual property. Using your existing product, we can help extend or modify the product to extend market share or to develop new market opportunities. We can also help modify products to suit new manufacturing processes or make improvements which can save time or cost. Gatehouse design can assist CTO companies to develop modular products to suit their assembly processes. Providing modular documentation required by different customers or markets. For example, documents may be required in different languages. Modular documentation can be used to simplify the production of documentation, streamlining the order fulfilment process. Modular documentation may consist of complete documents or modular content. Product configuration can be used to quickly and accurately select modular products. The product configurator eliminates the need for product design following an order. Product information is available immediately and is always current and accurate. Product configuration reduces time and cost and ensures accuracy. Where there are few product variants a document configurator may still be worth considering. Where the management of documents requires considerable time, a document configurator may be used. The document configurator creates or collates documents based on user selections. Documents may include commercial documents such as invoices, transport notes, technical manuals and instructions, compliance certification, product guarantees, export documentation and much more. Product configuration provides Sales teams speed and knowledge and can be used to generate documents at the touch of a button. Including product configuration moves a company towards a configure-to-order production model and creates opportunities for agile manufacturing. Design automation can be used to reduce design work further. A design automation system can be used to automatically produce 3D models, detailed drawings, pass information to ERP systems or other production systems. In some cases, design automation can automate fully design processes that would previously have taken hundreds of hours. We can help companies develop their business to become agiler. By embracing the power of a modular product, product configuration and design automation companies can provide customers with the exact product configuration they choose quickly and efficiently. Agile allows the company to respond to change rapidly and the modular products allow incremental product development to create new markets and opportunities whilst extending the life of existing products. Information will be shared easily throughout the business. Gatehouse.design specialise in engineering design processes which add productivity and efficiency for businesses. With particular expertise in the industrial sectors including, power, ports, chemical, minerals, food and bulk materials handling. © 2019 Gatehouse Design. All Rights Reserved.